Legumes need a good K-start! Field beans and peas are the main grain legume crops in the UK with, between them, around 250,000 ha grown. In recent years, lupins have become a significant crop and small areas of broad beans, soya beans and navy beans are grown. Field beans (including tick beans and horse beans) and broad beans are all sub-specie s of Vicia faba. Navy beans are a different species, Phaseolus vulgaris. Average yields of beans, peas and lupins in the UK are 3.5 – 4.0 t/ha but potential yields are much higher. These crops will repay attention to husbandry generally and to nutrition in particular. Potassium is an essential nutrient for legumes and all other crops. It is an activator for many enzymes, especially those involved in protein synthesis. Potassium also has an important role in maintaining water balance in the plant. In legumes, potassium is necessary for the proper development and functioning of root nodules. Rhizobium bacteria in the nodules fix atmospheric nitrogen and make it available to the legume plant. 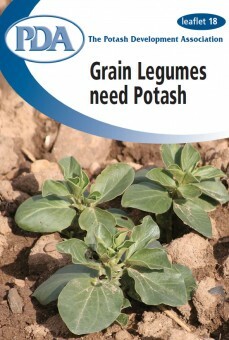 If nitrogen fixation is affected by potassium deficiency, the legume will suffer a nitrogen shortage and reduced yield. Source: The influence of potassium on the activity of Rhizobium bacteria. Proc. 11th Int. Colloquium, IPI. Serious potassium deficiency causes yellowing or scorching of leaf margins, forward curled leaves and, in beans, shortening of internodes (stem between leaves). As potassium is involved in nitrogen fixation in the root nodules, deficiency can also appear as an apparent nitrogen shortage, with stunted plants. Where there are visible symptoms of potassium deficiency, crop yield will have been significantly affected – less severe deficiency, which still affects yield, will not be visible. It is important therefore to ensure a good potassium supply and to avoid the occurrence of deficiencies. Concentrations in pea and bean leaf tissue of 1.1 – 1.2% K in dry matter have been associated with optimum potassium nutrition. Beans are quite deeply rooted but peas have a much less extensive root system. It is important that the topsoil is well supplied with potassium to support uptake by peas. Legumes can take up very large amounts of potassium as shown by work in France on white lupins. By late August at peak canopy, the crop had produced more than 20 t/ha dry-matter and had taken up around 400 kg K2O/ha. The grain yield of 3.3 t/ha removed 45 kg K2O/ha. Combined peas remove around 10 kg K2O per tonne of dry peas (fresh weight) and beans and lupins remove around 12 kg K2O/t of dry seed. Removal for a 4 t/ha crop will be around 40 kg K2O/ha for peas and 48 kg/ha for beans and lupins. In field trials at Rothamsted on silty clay loam soils, field beans responded up to around 200 mg/l soil K (upper soil index 2). Experiments on a sandy clay loam soil at two levels of soil potassium examined the response of wheat and field beans to two rates of fertiliser potash. Wheat yields were not affected by the level of soil potassium in the trial and gave no response to added fertiliser. Beans however yielded much less on the lower potassium soil even though the addition of fertiliser potash gave a large yield increase. The best bean yield was on the higher potassium soil. Rothamsted Research – Saxmundham data. Usually, potash will be applied to the seedbed in a PK fertiliser. Where large amounts of fertiliser potash are needed to improve low soil fertility, the potash should be broadcast and worked well into the seedbed. For spring sown crops, some of the potash can be applied in the autumn as muriate of potash. To avoid risk of damage to germinating seedlings, no more than 50 kg K2O/ha should be combine drilled.